What set me off on this unharmonious path was a post I stumbled across at “pork, knife & spoon,” the official blog of the National Pork Board. (My motto: I troll meat industry websites so you don’t have to.) A February 7, 2012 post entitled “Valentine’s Day Gifts for Pork Lovers” shamelessly features cute pig gifts–as if cute pigs are entirely divorced from the horrors of meat production. You’ll find Beanie Baby piglets, pig figurines, pig-shaped cookies, pig jewelry, Arnold the Snoring Pig (a plush pig who wiggles and snores! ), and more–and all offered without the least hint of irony. People love pigs in all their permutations, and the pork industry–and pig paraphernalia purveyors–know it. Compartmentalization is key here, people. Who doesn’t want a cute little plush piggy for Valentine’s Day? Certainly not anyone who doesn’t like adorable, huggable piggies, that’s for sure! These little guys come in an assortment of Valentine colors (red, pink, and white) with little embroidered hearts scattered around their piggy bodies. Think of them as little heart kisses. Now that you’ve confronted your dissonance, cognitively-speaking, here are just a couple of suggestions for Valentine’s Day observances. I know, I know, it’s beyond the last minute, but these gifts take just a couple of mouse clicks, and one of them doesn’t even require money. First, make a donation to your local farmed animal sanctuary in honor of someone special. Small sanctuaries are almost always looking for help with feed and electricity costs, especially at this time of year. 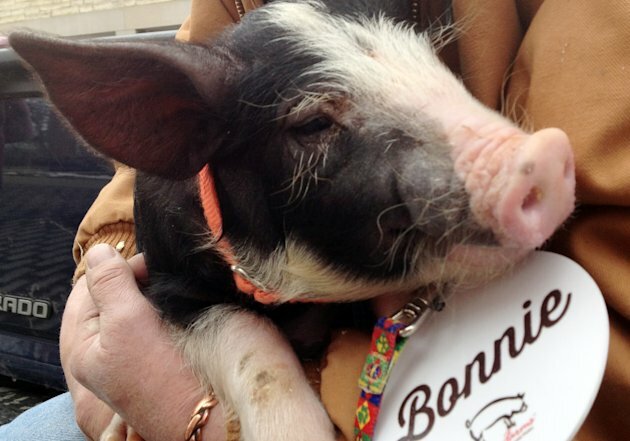 In each and every one of those sanctuaries–guaranteed–are animals with stories as compelling as Bonnie’s. Next, announce your gift with a valentine e-card from Vegan Peace. Finally–and this is simply a suggested gift to give to yourself and the animals–if you’re still eating the Bonnies of the world, consider cutting back, going vegetarian, or going whole hog (couldn’t resist) by going vegan. Keep exposing those CDs (cognitive dissonances) with your witty and wise words, Kathleen. Your posts always make me smile and frown at the same time, if that’s possible. In a mixed bag of emotions I too am grateful for all your posts Kathleen. Meanwhile because I know these aren’t the most forth-right folks I can’t help but wonder about Bonnie… “Pardoned” for how long? Everything about them is all for show – Bet somewhere they’re already planning a Bonnie-Bacon-Bonanza. Anyone who lies to themselves with such narcissistic conceit just can’t help themselves. Those “roses” look revolting…and I can only imagine the foul smell once those sit out in room temperature for awhile. The only creature I can imagine they would appeal to is my dog…and he eats his own poop. Thanks for a much-needed laugh, 19peace80. Provoked–that video is truly an embarrassment. “Trivial decadence”–yes. I suspect that the genesis of this whole bacon frenzy thing is an industry inside job, don’t you? @ Kathleen– Yup. Has to be. Everyone even slightly literate in health knows bacon is one of the worst meats health-wise. Packed with fat and cholesterol, heavy consumption of bacon and similar processed meats is also implicated in Type 2 diabetes. So there’s nothing positive you can really say about bacon, advertising wise. Picture the board meeting in which some PR person leaps to their feet and says, “I know! We’ll make bacon COOL! Tell ’em all the hip kids are eating it and they don’t wanna be left out!” Genius. Agreed Kathleen! Fanatical lard love is an inside job for sure: The United States of Bacon illustrates the rotten decay from within.